The chairman of the committee had sat on it since its inception. He could remember with clarity of thought the days when the meetings took place in the pub and the planning of the festival had been lubricated by pints and not cups of tepid tea. He was a keen believer in democracy and everyone having their say from a level playing field but over the years he had come to the realisation, and this perhaps coincided with the swapping over of pints for tea, that allowing every man and woman have their say just gave way to too much talking. He had listened carefully and with some patience to Patrick Tobin’s debunking of the rumour around the cowpat competition that had taken place in Ballycotten and now he felt it was time to call the meeting to some order. There he said it. He sat back in his chair and waited for the debate. The chairman sighed. Spice what was needed. Something to bring in the crowds and as for the family entertainment there was nothing the kids liked more than the right placed scatological cow. But he knew that the committee and the cups of tepid tea would be against whatever the benefits. The talk turned to the cake tent and who would be manning which stall and the chairman let his mind wander. The mackerel competition would still be the culmination of the weekend. There could be nothing to disturb that and there were clear lines and logic behind the enterprise. There were as many boats as the people could find but beyond that they were limited by the time, three hours, and the number of fish in the bay. It was all fixed and certain and at the end there were enough people to watch over the counting of the fish. Although, he reflected, there always the possibility of bucket or two of fish being slipped under the covers of a boat early in the morning before the village was up. He put the thought to the back of his mind. There was too much purity in the competition for that. He was troubled by the duck chase. Last years duck had almost had its neck broken by the eager young feck who had caught up it with on the rocks up from the water down by the bottom of the pub’s garden. The same duck had been the veteran of three previous festivals and it was generally agreed that it was fleet and adept at keeping out of the hands of the lads chasing after it in the water. The hope had been that it would be all okay for this year. But the chairman had heard it whispered that there was a timidity about it still and the fellow whose duck it was could not give him the cast iron guarantee that it would be ready in two weeks time. If the duck was not ready then another would have to found and two weeks wasn’t much time to find a replacement. The chairman paused in his thoughts to listen to what was being said around the table. The talk was still on cakes. Those men with imagination had been dulled with the tepid tea. He needed to rouse himself and bring the talk back to order and concentrate on the main theme. What spice could be brought in to replace the cowpat competition and what to do about a replacement duck. The festival committee was quorate. Twelve good men and women were sat in the hut and they had some decisions to make. It was mid-July and there were two weeks to go before the start of the festival. All was almost done and organised and in place, sand had been order, and the pumps had been primed and the people were ready and eager, they just had to wait on the weather and a decision on what was to replace the cow-pat competition. In the past the meeting would have been assembled in the pub around black pints and packets of bacon fries and Tayto Crisps. There would have been plenty to cool a man down. But today the committee were in the hut bought with the proceeds from the previous years festivals. There were those that grumbled that the proceeds could have been better spent lubricating the thinking minds of the more established men but they had been quietened by modernity and those men were left to stare dismally at the cups of tepid tea and the plates of biscuits that were there was to keep them going in the heat of a mid-summer evening. Two years had passed since the disaster of the last cow-pat competition and nothing had been found to replace it. There were those that thought that some lubrication would assist in the thinking process but they kept their counsel for now. There was agreement on there being too much risk, rancour and bad blood to be able to run the competition again and there were rumours that in the intervening year there had been a similar competition that had taken place in Ballycotten which had ended messily for two of the local lads. Patrick Tobin swore that it was more than a rumour. He had a cousin who had been there and seen what had happened. At this point of the story Patrick Tobin’s voice took on a melancholy tone as he went on to tell the inevitable conclusion. ‘Those brave lads got it right in so many ways but there were flaws in their logic. The cow woke at seven in the morning as the sun was starting rise high in the morning sky. Having woken the cow pulled itself to its feet shaking its tail as it did so and at this point the two pieces of string did their job to excellent effect. The two big toes were pulled hard and the lads were awake in a rush with thick heads and dry mouths. But it was the timing of it all that did for them. The cow was awake and so were the lads but there was no time for the lads to undo the string before the cow took upon itself the need to sort out its business for the day. It had forgotten the dark van and the eager crowds and was relaxed now in a green field under the sun and so contented with the morning it lifted its tail. Patrick Tobin paused for a while so the impact of the story could be taken in. And the twelve minds were turned again to their deliberations. Truth be told the courgettes have been disappointing this year. The slugs got to three or four of the seedlings and two of those that survived were straggly and weak. But they are now starting to bear fruit and typically the two that I picked yesterday had managed to grow a day or so too big. Those two have been bolstered by a gift of three yellow courgettes. We will eat them all this evening fried in olive oil until golden with garlic and thin slices of red chilli and then stirred into a pan full of cooked penne pasta with feta cheese, lemon juice and parsley. We have a glut of courgettes and I was planning to cook some for lunch, finely chopped in olive oil with garlic and then mixed with pasta, lemon juice and some chilli but then someone suggested gazpacho, so we had that instead. The 50p corner at the veg shop had a couple of kilo bags of soft tomatoes. I bought those and a couple of peppers and half a cucumber and I was done. I had everything else I needed at home. Of course one of the beauties of making gazpacho is that there is no cooking involved. I have a memory of Keith Floyd making some on the beach in Torremolinos in his series about food in Spain. For years I thought that he had made it by putting all the ingredients into a black plastic bin and then using a small outboard motor to liquidize it. Whilst that is an attractive though I have managed to track the clip down on YouTube and there were no outboard motors involved. I made mine in a Magimix, pulsing tomatoes, cucumber, peppers, onions and garlic and rubbing it all through a sieve with the back of a spoon. I seasoned it with olive oil, sherry vinegar, salt, pepper, a shake of Tabasco and a small handful of mint leaves. I put the bowl in the frezzer for half an hour before we sat down to eat. We ate it outside scattering croutons into the soup. It has not been as hot today but there is a closeness and stickiness in the air. We have been listening to Miracle Legion. 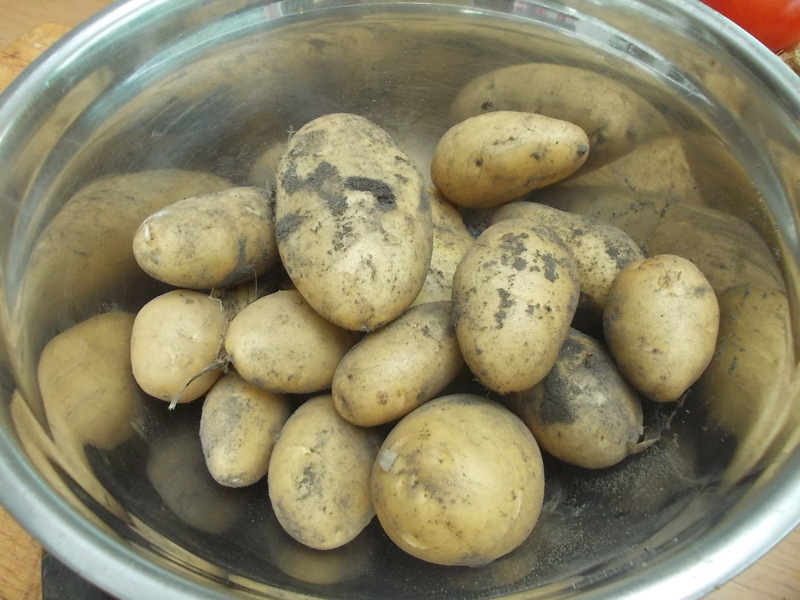 Tonight we will have the first of the potatoes from the garden. We will have to make the most of them. There aren’t very many!